Ivory Coast is one of the major departure points for migrants travelling illegally to Europe. Without a job or a tangible future in their country, many risk their lives seeking a better one abroad. To combat this pattern, the European Union is working in conjunction with the International Organization for Migration (IOM). Collective reintegration projects, such as business partnerships between returning migrants and members of their community, aim to discourage risky irregular migration through sustainable work and dialogue at home. To see how it works, Euronews travels to Ivory Coast, which recently hosted the African Union-European Union summit. Abidjan, Ivory Coast’s economic capital, is one of West Africa’s most highly urbanised cities. But behind its apparent success story, and despite being among the world’s biggest exporters of cacao, coffee and bananas, Ivory Coast is still plagued by poverty, which affected nearly half the population in 2015. Many young people faced with unemployment try to reach Europe. 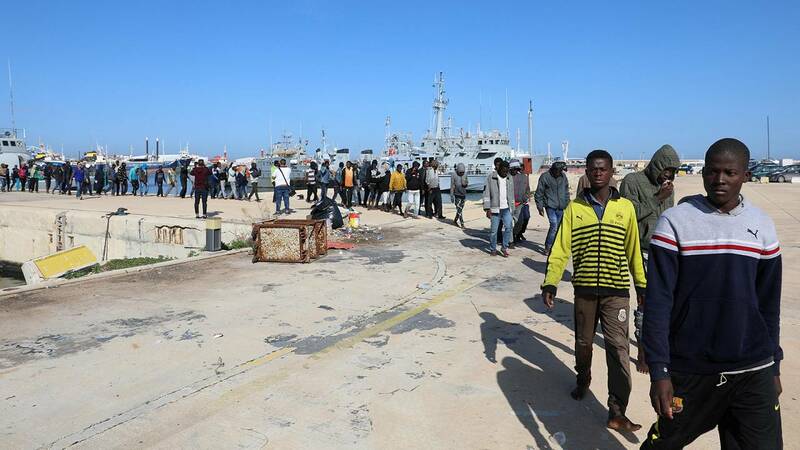 According to the IOM and the EU, among the 155.000 migrants who reached Europe between January and November 2017, most came from West Africa. We meet Jean-Marie in the capital Abidjan. He is one of many who was seduced by the prospect of a better life beyond his country’s borders. A promising football talent, he was lured to Tunisia by a so-called “sports agent” who took his money and disappeared. The IOM helped Jean-Marie return home and set up a business as a chicken farmer. Voluntary return and its follow-up are priorities for the EU, which funds the IOM’s projects. According to the EU’s foreign policy chief, Federica Mogherini, interviewed by Euronews, the EU has helped 14,000 people return home this year. To prevent Ivory Coast’s youth from leaving, there need to be jobs for them. The country is the world’s biggest producer of cacao, most of which is consumed as chocolate in Europe and North America. But cocoa farmers in Africa are deeply affected by the fluctuating prices of cocoa. Overproduction this year caused prices to drop. Moreover, what Ivory Coast lacks, says Euronews’ Isabel Marques da Silva, is the processing industry. “A cooperative working in the fair trade business gets better prices for its cacao. But the added value is in the transformation process, which does not takes place in Ivory Coast. So in the end, the farmers get less than 10 percent of the price of a chocolate bar made and sold in Europe,” she says. There are exceptions like the Société Coopérative Equitable du Bandama, in the town of M’Brimbo, northeast of Abidjan. It brings together Ivory Coast’s first certified organic and fair trade cocoa producers. Thanks to this certification they have developed their own trade channels and are therefore spared the price fluctuations of the regular market. The next step would be to make the chocolate locally. Entrepreneurship in Africa is booming as is the digital economy. Computer engineer Guiako Obin is the co-founder of Babylab, a Fab Lab where local children in the deprived neighbourhood of Abobo in Abidjan can come and learn about computers, upcycling and coding. “What we need is to lobby local authorities in order to copy what’s being done in other parts of Ivory Coast and Africa,” Guiako tells us. The development of digital opportunities was at the heart of the recent EU-Africa Business Forum in Abidjan. The forum took place ahead of the EU-African summit, where leaders agreed on four key priorities for the coming years including economic opportunities for youth, peace and security, mobility and migration, and cooperation on governance.